Product #20581 | SKU JB01330 | 0.0 (no ratings yet) Thanks for your rating! 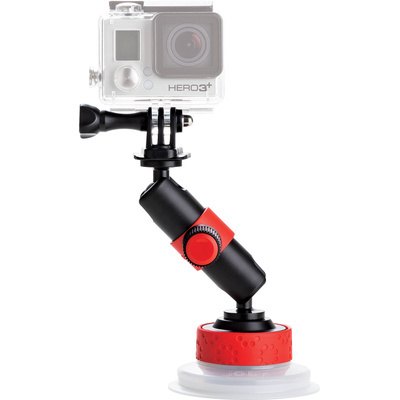 The Suction Cup & Locking Arm from Joby mounts your action camera on flat, non-porous surfaces using an industrial strength suction cup that locks in place with a simple quarter turn of its base. Attached to the Suction Cup is a Locking Arm that lets you position your camera at any angle thanks to two ball joints that rotate 360° and pivot 180° from side to side. The arm locks in place with a tightening knob that won't come loose from vibration. A 1/4"-20 screw at the end of the Locking Arm lets you attach your camera, or a GoPro tripod mount for use with GoPro cameras.